All beer festivals are not created equal, so as well as going to them for the beer list I like to see how different organisers do things. 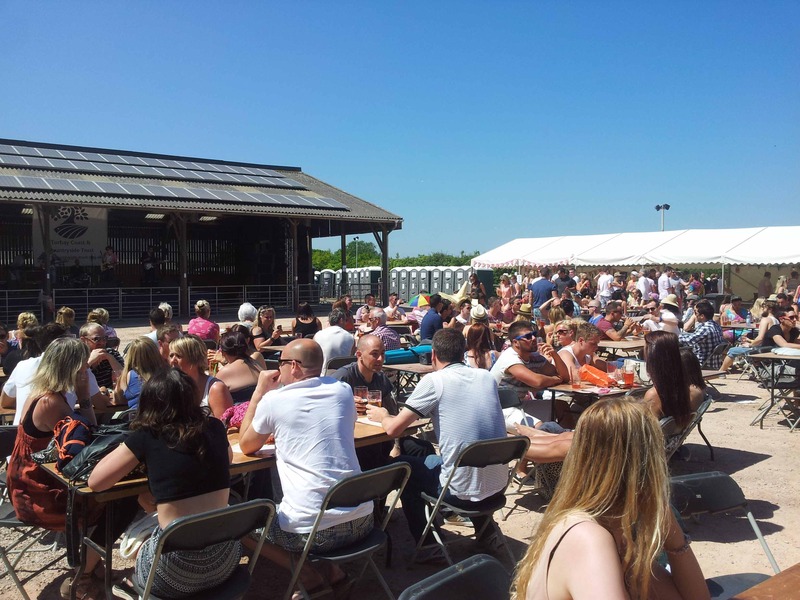 A couple of weekends ago Beer Husband and I took a trip to a Occombe Farm Beer Festival which is a big event in Torbay’s calendar and often sells out. I was warned by the organisers that it wasn’t like most beer festivals, rather it was a bit ‘rough and ready’ with lots of young people out for a good time and not to expect lots of ‘old guys sitting around enjoying their beer’ (I’m paraphrasing but that was the gist of it). Having attended the school of rough and ready I told the nice woman who organised press tickets for me that it shouldn’t be a problem. Arriving at the festival at its 2pm opening time a fairly lengthy queue had already built up which wasn’t surprising given the sunny weather and the fact the Saturday of the festival was sold out. It was mostly populated with the aforementioned young people, a few of whom were already swilling green bottles of lager, or fruit cider, which they were compelled to leave at the entrance – which was staffed by security men and women who were intently checking IDs and conducting bag searches, presumably for hidden bottles of booze. 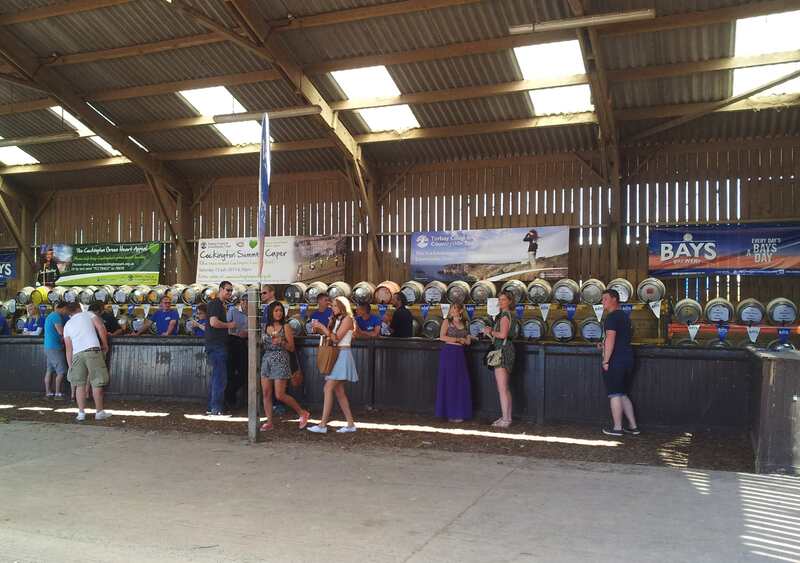 Passing both checks – although we had to give up our bottle of fizzy water* – we went inside and headed for the token stall as, in common with many other beer festivals, Occombe Farm operates a cashless bar. A £1.75 token bought half a pint, which made the beer pretty pricey on top of an entry fee of £13** (£10 on Friday) – but then again the festival is a fundraising event for the Torbay Coast & Countryside Trust – a conservation charity which, as well as Occombe Farm, owns and manages several other local sites including Cockington Country Park, near Torquay, and Berry Head, close to Brixham. Once inside a band was already on stage, belting out covers through a pretty decent PA. It’s safe to say the festival is as much music-based as beer-based. Long tables and folding chairs had been set out throughout the courtyard (farmyard) so people could sit down with their beer and make the most of the music. Live music and beer is of course a tried and trusted formula – but as there wasn’t really anywhere to escape the volume of the music it made it more of a trial than a joy. The food on offer at the festival was initially hard to locate being tucked away behind the stage. 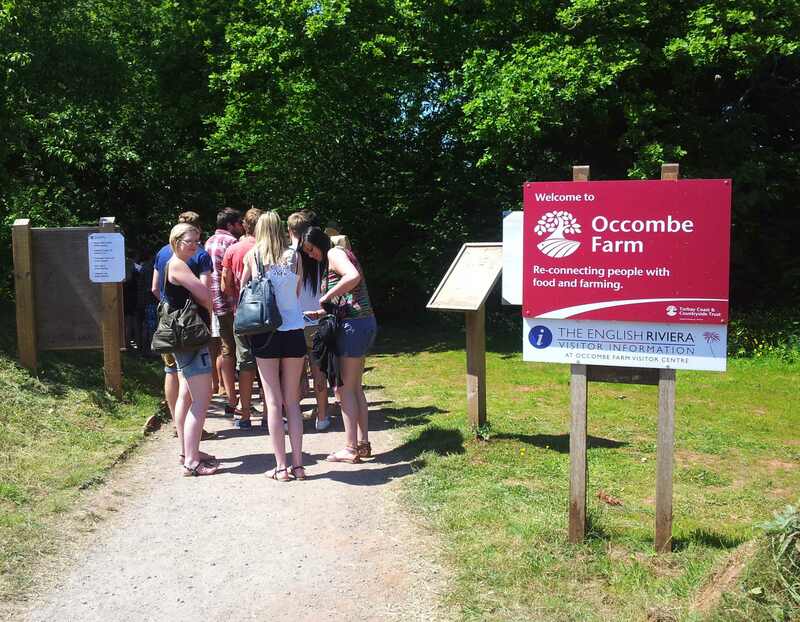 I had high hopes for a good experience given Occombe Farm’s reputation but the staff on the burger stall could tell me little about the origins of the meat and burger itself was unremarkable and actually a little gristly. I was also disappointed at the lack of relish, salad or fried onion and that the cheese I ordered with it was grated and so fell out all over the place as I tried to eat it. I started off with Adnams Kristal White (4.2%) which was a last minute substitution for a more local brewery that had to pull out. As I’d not previously had a chance to try this I was pleased it was Adnams’ who stepped in to fill the gap in the menu. The beer wasn’t as clear as I expected (perhaps owing to the last minute nature of its presence) being a somewhat cloudy, dark gold with an orange tinge. It had a smoky, clove aroma which carried through to the flavour of the beer where it was met by a balanced hoppiness followed by a dryish finish. The vanilla flavours one might expect from a wheat beer showed up mostly in the aftertaste. Overall I felt it a good effort and worth looking out for if you normally stick to your usual but want to branch out. Next I had a drop of Branscombe Vale Branoc (3.8%) which did at least lift the disappointing burger a little. This bitter from East Devon has a decent level of hops which are emphasised by pairing it with cheese. One to try if you are in this part of the world. The Cotleigh Lemon Ale (4.3%) was a big let down and the one beer I had that I thought might not be at it’s best in terms of quality. It looked good: a dark but clear gold beer and it had an enticing lemon mousse aroma but the Pacific Jade hops which the tasting notes boasted of were virtually undetectable and the more I drank the worse it tasted with dank, acrid and stewed flavours indicating something had gone pretty wrong with this beer. South Hams Wild Blonde (4.4%) was pretty drinkable albeit not earth-shattering. I felt it needed more hops to boost its light floral flavour. Town Mill Brewery Revenge (5%) had a lovely hay bale aroma and a tasty sweetish, bready fruity marmalade flavour. It paired very well with the Tom’s chicken and leek pie! My final beer of the day was Yeovil Ales Posh IPA (5.4%) This brassy coloured brew had a zesty, citrus hop aroma with shades of biscuit and a similar flavour with lip-smacking qualities reminiscent of a Burton pale ale. The verdict: This would be a good festival to go to with a crowd of mates rather than with your partner/husband/wife/boyfriend/girlfriend. Had it not been such a hot day, or had there been an obvious place to get out of the sun (other than propping up the bar which we were eventually driven to do) and take a break from the music then we would have had a MUCH better time – which is not to say this isn’t a good event. But, if you plan to attend in future years my main advice is be sure to bring a sun hat if the weather calls for it. * Free drinking water was readily available inside though. ** Disclaimer: I was given two complimentary tickets to the event so I’m not complaining about the prices – merely reporting and offering an opinion as to what your average punter might think about it.